This addon is an addition to Harven's Custom Map Pins (depends on it). It adds a button to the interaction menu, to allow you to add a marker for the item or NPC currently focused with a single keystroke. The focus gets categorized. The description is generated from the category and the name in the focus. In the settings a "predefined" from Harven's Custom Map Pins can be assigned to each category. If no category could be found, a standard pin is generated. Afterwards the pins can be edited or deleted as usual. The categorization can be modified or extended by editing the lang\strings.lua file. Right below "Interact with Player". 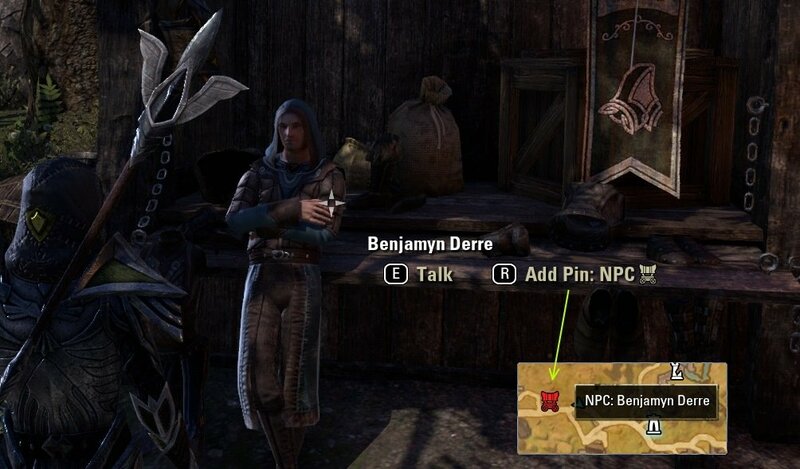 NPC can be categorized to Merchant, Banker and Guild Merchant. But this requires the reticle to focus the NPC. The interaction menu and the reticle have different focus priorities. Thus a NPC may first get categorized as NPC and afterwards it changes to a more precise category. This un-nice limitation was the reason why I did not implement it ealier. But it was requested. So here we are. Dieses Addon ist eine Ergänzung zu Harven's Custom Map Pins (ist erforderlich). Es fügt dem Interaktionsmenü eine Schaltfläche hinzu, mit der für den fokusierten Gegenstand oder NPC per Tastendruck ein Marker gesetzt werden kann. Der Fokus wird automatisch kategorisiert. Die Beschreibung wird aus der Kategorie und dem angezeigten Namen generiert. Jeder Kategorie kann in den Einstellungen ein "Predefined" aus Harven's Custom Map Pins zugewiesen werden. Für alles, für das keine Kategorie gefunden wurde, wird ein Standard Pin angelegt. Danach sind die Pins wie gewohnt bearbeitbar oder zu löschen. Wer möchte, kann die Kategorisierung bearbeiten oder erweitern indem die lang\strings.lua angepasst wird. Bevor die Funktion genutzt werden kann, muss eine Taste zugewiesen werden (Pro Charakter). Geht dazu in das Optionenmenü->STEUERUNG->Tastenbelegung->Interaktion->Pin hinzufügen. Direkt unter "Mit Spieler interagieren". NPC können jetzt in die Kategorien Händler, Banker und Gildenhändler eingeteilt werden. Dazu muss der NPC mit dem Fadenkreuz fokusiert sein. Das Interaktionsmenü und das Fadenkreuz haben unterschiedliche Prioritäten beim Fokus. Daher kann es sein, dass ein NPC erstmal der Kategorie NPC zugeteilt wird und später auf eine genauere Kategorie umspringt. Diese unschöne Einschränkung war der Grund, warum ich das nicht schon implementiert hatte. Aber es wurde gewünscht. Also ist das halt so. - Moved key-bind in it's own category. As requested. - Support of Gamepad style. 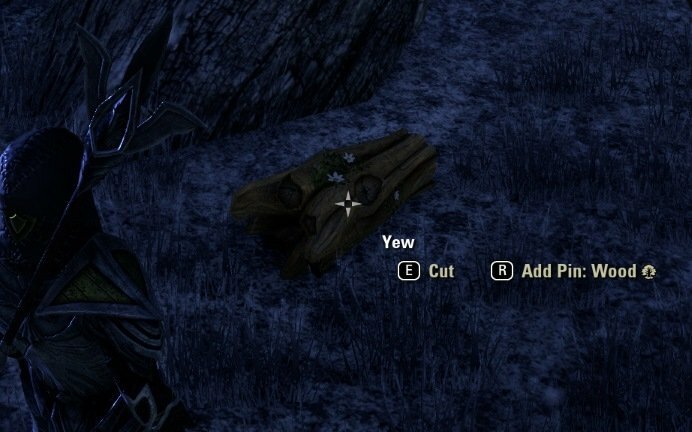 - API 100017: ESO 2.6 'One Tamriel' ready. - Added Moneylender to category banker. 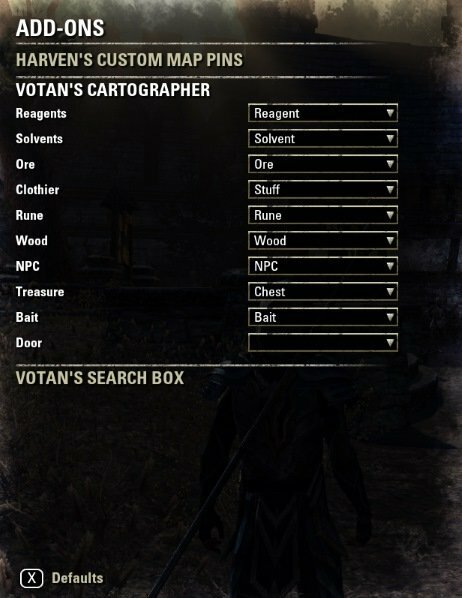 - "Dual * Rune" => "Protean Runestone"
- Fixed Rune text for ZOS has changed to single type. - Fix changed german translation "SchlammanhÃƒÆ’Ã†â€™Ãƒâ€*Ã¢â‚¬â„¢ÃƒÆ’Ã¢â‚¬Â*ÃƒÂ¢Ã¢â€šÂ¬Ã¢â€žÂ¢ÃƒÆ’Ã†â€™ÃƒÂ¢Ã¢â€šÂ¬Ã‚Â*ÃƒÆ’Ã‚Â¢ÃƒÂ¢Ã¢â‚¬Å¡Ã‚Â¬ÃƒÂ¢Ã¢â‚¬Å¾Ã‚Â¢ÃƒÆ’Ã†â€™Ãƒâ€*Ã¢â‚¬â„¢ÃƒÆ’Ã‚Â¢ÃƒÂ¢Ã¢â‚¬Å¡Ã‚Â¬Ãƒâ€¦Ã‚Â¡ÃƒÆ’Ã†â€™ÃƒÂ¢Ã¢â€šÂ¬Ã…Â¡ÃƒÆ’Ã¢â‚¬Å¡Ãƒâ€šÃ‚Â¤ufung" -> "Erdhaufen"
- German: Fixed issue with "KÃƒÆ’Ã†â€™Ãƒâ€*Ã¢â‚¬â„¢ÃƒÆ’Ã¢â‚¬Â*ÃƒÂ¢Ã¢â€šÂ¬Ã¢â€žÂ¢ÃƒÆ’Ã†â€™ÃƒÂ¢Ã¢â€šÂ¬Ã‚Â*ÃƒÆ’Ã‚Â¢ÃƒÂ¢Ã¢â‚¬Å¡Ã‚Â¬ÃƒÂ¢Ã¢â‚¬Å¾Ã‚Â¢ÃƒÆ’Ã†â€™Ãƒâ€*Ã¢â‚¬â„¢ÃƒÆ’Ã‚Â¢ÃƒÂ¢Ã¢â‚¬Å¡Ã‚Â¬Ãƒâ€¦Ã‚Â¡ÃƒÆ’Ã†â€™ÃƒÂ¢Ã¢â€šÂ¬Ã…Â¡ÃƒÆ’Ã¢â‚¬Å¡Ãƒâ€šÃ‚Â¶che"
- Fixed "Add Pin" does not work for fresh new maps. - Added "Netch" to "Leather"
- fixed action for "Heavy Bag"
- localization of "Already exists"
- fixed issue coming up with WaypointIt. Thanks to circonian for helping out. - Add Scrib and Centipede for bait. This addon is just an extension to Harven's Custom Map Pins. So, this addon does not store anything. But Harven's addon has a share function via chat. For one pin only I did not test, if it still works. But, if you want something like HarvestMap, why not using HarvestMap? I am sorry, maybe I have expressed me incorrectly or misleading. I do use HarvestMap but it doesn't track the data of leather or baits. For this I use your addon now. 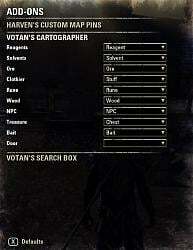 I wanted to share the data for leather and baits from your addon with my friends. But telling me the addon does not store anything clarifies my question. So it's also probably not possible to hide pins created by your extension? Even if this is the case its still a great work! First Thank you very much for this great mod! 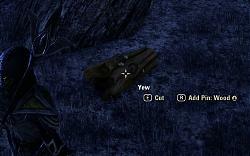 Is it possible to hide your pins created by your mod? Last edited by Atarla : 10/04/18 at 06:19 PM. Re: Re: more Icons ? One has to find a person drawing them for free. If there is more than one icon collection addon, the icon index could shift and mess up the pins. You have assigned a key to "Add Pin"? Important question: Did you assign a "Predefined" to one of the Harven's Custom Pins? Oh that's how they work ok i'll try that, Thanks! Last edited by Mitsarugi : 10/21/16 at 12:43 PM. I was wondering if I would be able to have two categories of pins, one for territories and one for location pins, and be able to control their scale and level independently from one another. That way I can keep the location pins one size while being able to resize territory auras, because RPers love disputing that stuff. I'm not an expert, but I think I can get by with some advice on implementation. Modifying Harven's Custom Pins is the better direction, because the saved variables do not get overwritten on updates. Thanks for the help, i got it working with your info on the predefines. Last edited by mistik911 : 09/07/15 at 04:12 PM.